Bloomy Energy Systems co-exhibited with National Instruments (booth #425) and DNV GL (booth #1359) at DistribuTECH in San Antonio, TX from January 28 to 30, 2014. At Bloomy Energy Systems, we provide monitoring, control, and test products for companies developing high-performance energy storage systems (ESS). 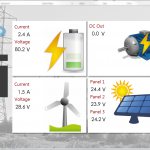 Systems include ESS performance testing; ESS embedded control and monitoring; and distributed microgrid monitoring. Bloomy Energy Systems will be exhibiting at the Northeastern University & Sandia National Laboratories Renewable Energy Storage Symposium August 13-14, 2013 – Northeastern University Campus in Boston, MA.